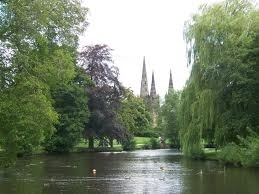 Beacon Park is a great community asset for the whole city and district of Lichfield. It is set to the West of Beacon Street and is bounded by Swan Road to the South and Abnalls Lane to the North. Beacon Park is one of Lichfield’s historic parks and a major overhaul was completed in Easter 2013, using money from the Heritage Lottery Fund. 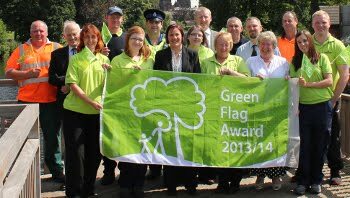 It now has a Green Flag Award and was visited by The Princess Royal who re-dedicated a statue of Edward VII, her great, great grandfather. After a guided tour of the park, she gave it her royal seal of approval. The statues and memorial plaques in the park give some indication of Lichfield’s historical past and are explained on information boards to be found throughout the park. The park is used by many people enjoying the formal planted beds, large green open spaces, tennis courts, bowling greens and pitch and putt golf course. Children enjoy the revamped play areas and refreshments are available daily from a bistro café serving hot and cold food, drinks and ice-creams. There is a woodland walk, community garden and meeting places available for all to enjoy. BSARA represents member’s views through the Park Friends group. BSARA also has an interest in the Museum Gardens, Remembrance Gardens, Minster Pool and Walk which lie at the Swan Road end of Beacon Street. For further information about events and activities taking place.